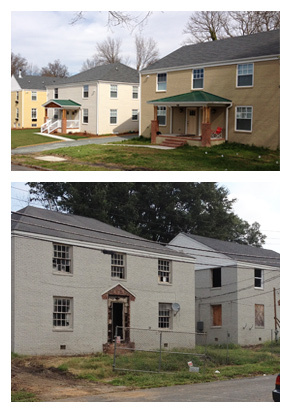 The North Street Community Project consists of 16 multi-family buildings located within a two block area in the Central Park neighborhood of Durham, NC. Built around 1942, these 16 buildings make up the majority of the 17 total similar style buildings found within these two city blocks. The neighborhood and these buildings have seen many generations of new residents, some renovation, and much neglect. The neighborhood around these blocks has had a similar history, but in the recent past there have been wonderful pockets of infill redevelopment, rejuvenation, energy and investment. As one of the last pockets of property that have not had favorable attention or investment, the North Street Community property presented itself as an opportunity for new life. What began as an idea in the community meeting rooms of the nearby Reality Center, a vision was born to create a neighborhood support network where people with and without developmental disabilities can live together in community. The idea grew from a core group of families who wanted to find a way to bring this vision to life. As the energy and enthusiasm for this idea spread, more and more supporters joined in the effort to find a way to bring the dream alive. In 2011 the North Street property was identified as a potential site, and Legacy Real Property Group was able to purchase the property and begin serious planning. Many experienced professionals and industry leaders committed time, energy and skill to help plan, design and formalize the vision that has now turned into the North Street Community Project. Assistance from architects, engineers, contractors and attorneys was incredible. They all pitched in to help make this community a viable option for many diverse families from many diverse backgrounds. The basic scope of work was to renovate the existing buildings into suitable primary residences for a diverse group of families who understand the mission and vision of the community and not only benefit from it, but also contribute and help support it. The project started with the 14 buildings that contained 56 apartment units. Each finished building continues as a multi-family building but ranging from 2 to 3 dwelling units. After some initial clean up and demolition, the interior of each building or unit was customized to meet the needs of the new families that would reside there. The exterior of the buildings benefited from new energy efficient upgrades and common areas serve as community space. The buildings and units were sold to new residents, but some rental opportunities will exist. A new Property Owner Association (POA) has been put in place to help maintain the structure of the community and protective covenants will enable the mission and vision of the community to survive for future generations to come. The first phase of residents moved in during the summer of 2012, with the final phase completed in 2017. With the help of a dedicated team of professionals, a core group of residents, and the blessings of many, the North Street Community has become a reality for many families.